"The Pool Guy" is the one-hundred and eighteenth episode of NBC sitcom Seinfeld. This was the 8th episode for the 7th season. It aired on November 16, 1995. The end credit states "In Memory of our Friend Rick Bolden" (Rick Bolden was one of the musicians working out the Seinfeld Theme). Elaine befriends Susan. Jerry meets his pool guy outside a movie, and then he can't get rid of him. George is worried by Elaine wanting to get to know Susan ("The two worlds collide!"). Kramer's new phone number is similar to a film information line. 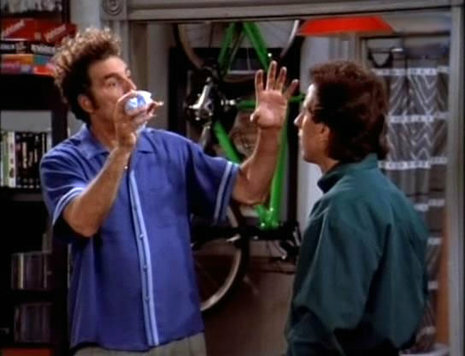 When Kramer keeps receiving wrong numbers, he begins giving out the information for movie show times à la Moviefone. The real-life Moviefone man, Russ Leatherman, provides his own voice during the final scene of this episode. He is only seen on screen from behind, however, and a body double is used. Interestingly, when Kramer is acting like Moviefone, you can see several pasta sculptures (similar to Fusilli Jerry) in the background.